HP Pavilion TouchSmart 11 is an affordable touchscreen laptop. It is a compact laptop with an 11.6-inch touchscreen, which makes the best of the full Windows 8 OS. HP Pavilion TouchSmart 11 features powerful quad-core or dual-core processors and is great for students and mobile workers. HP Pavilion TouchSmart 11 is one of the few affordable laptops offering touchscreen, competing with the likes of the Asus Vivobook S200E which also comes with an 11.6-inch touchscreen and the HP Pavilion 10 TouchSmart which offers a 10.1-inch touchscreen. With touchscreen the Pavilion TouchSmart 11 unleashes the full potential of the modern UI of the Windows 8. HP Pavilion TouchSmart 11 features AMD quad-core or dual-core A4 processors with 2GB or 4GB of RAM with AMD Radeon HD Graphics. 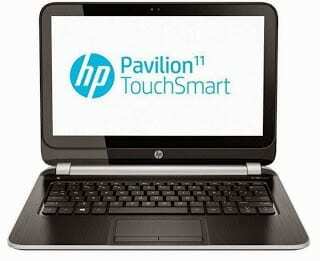 HP Pavilion TouchSmart 11 comes with 320GB or 500GB hard drive. HP Pavilion TouchSmart 11 laptops has an HDMI port, Ethernet, 2 x USB 3.0, 1 x USB 2.0, Headphone, Microphone, Bluetooth, and Wi-Fi 802.11a/b/g/n. It also has a 720p HD webcam. HP Pavilion TouchSmart 11 laptop is available in Nigeria at leading computer stores and online stores in the country. HP Pavilion TouchSmart 11 Price in Nigeria ranges from N81,000 to N92,000 depending on the configuration and your location in the country.